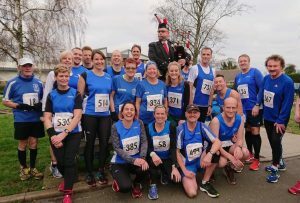 Photo: The Highland Piper with Newmarket Joggers at Little Downham. A very Happy New Year and Hogmanay to everybody! Catching up over the Christmas holiday period, Sarah Boneham (1:53:40) and Lisa Jennings (2:36:13) had a go at the Great Barrow Challenge (GBC) Tripple Tipple Half Marathon on Sat 29th Dec in the village of Barrow. It was Lisa’s first HM of the year and the third for Sarah, who clocked her best time of 2018, beating her time in the GBC Spring Quad HM last April by over 3 minutes. There were no takers for the GBC marathons. Up at Peterborough on the 31st December, Paul Dockerill was the lone Jogger entered for the Sublime Peterborough NYE 10K. He had a great run, achieving an all-time PB of 39:30, his first ever sub 40 minute 10K, and finishing 19th of 640 runners overall, 7th of 51 in his MV40 category. At the last hour, this moved him from Gold (65%) into Platinum (70%) in the 2018 club standards table, which is based on age grade % performance in the current year. In 2019, the old 2018 table will be available to view for comparison but the new table will start afresh, so you are challenged to re-establish your age-graded performances over the various distances for the current year. Meanwhile, the big draw for 33 Newmarket Joggers was the Ely NYE 10K at Little Downham (see photo above). It’s basically a flat course, typical of the fens, but with a noticeable bit of downhill in the first mile and some uphill in the last. The temperature was ideal at about 11°C and the weather fair, without too much in the way of wind. Many thanks to the kilted Highland piper, who played us up the steepest part of the hill with his bagpipes on full throttle. Neil Pollard (34:41) ran a corker of a race, his fastest 10K time of 2018, finishing 3rd of 616 runners overall and 1st of 50 in his MV40 category with age grade 79.9%. Next home for the Joggers were Chris Gay (36:47, 73.0%) and Jamie Sales (41:02). Leading Joggers’ women were Sarah Boneham (47:41, 69.4%), 3rd of 50 in her FV45 category and 45th of 283 female runners overall, followed by Pauline Green (50:27, 73.0%), 3rd of 22 in the FV55 category, with Danielle Jones (54:13) in third. The other Joggers to finish in order of time were: Jon Brooker (42:06PB, 73.2%), Jamie Rule (42:25PB), Adam Maltpress (44:17), Andrew Taylor (45:34), Neil Williamson (47:19), Richard Groom (48:27), Alan Shand (48:51), Jeremy Reader (49:54), Mike Sales (50:00), Jonathan Ollington (52:03), Brian Munns (53:08), Miles Johnson (53:23), Jill O’Grady (54:20), Sarah Sales (54:24), Alison McKenzie (55:16), Carolynn Anderson (55:25), Jan Holmes (55:37), Chris Aylmer (55:39), Lynda McCormack (56:17), Baz Colley (56:29), Jim Withers (57:41), Alan Thornhill (58:30), Sianie Painter (58:39), Sarah Kinston (60:17), Lisa Jennings (63:55), Svitlana Zinchenko (65:42) and Caroline McIntosh (68:28). Lynda McCormack climbed from Silver to Gold in the 2018 club standards table, as a result of her effort in the Ely NYE 10K.